No one knows the exact number of deaths, but in the past three days, more than 200 cows are estimated to have died. ALIGARH | BULANDSHAHAR: In the struggle to handle the problem of stray cattle in west Uttar Pradesh, cows are the real sufferers. While farmers are worried about stray cattle destroying their crops, the lack of better facilities and shelters for cows has resulted in them being left mostly to die. On Thursday morning, another challenge cropped up for the state government and the local administration of Aligarh and nearby areas. Cow vigilantes from the Vishwa Hindu Parishad, Bajrang Dal and Hindu Yuva Vahini blocked a state highway, protesting the death of a dozen cows the previous night near the Iglas area. The groups alleged some of the cows were still alive when they were buried by local villagers. “We got the information from some local people that not all the cows were dead. Some of them were buried alive. We can’t tolerate this kind of cruelty on cows,” said Dharma Bhaiya, district in-charge of the VHP. The police ended the blockade after a couple of hours and said only dead cows had been buried. Protecting stray cows remains the larger issue, with some of the animals that are roaming around dying due to the extreme cold. “The biggest problem with the cows is the cold weather,” said Chandra Bhan, veterinary officer in the Tappal area. “Most of the cows, especially the young ones, are getting cold stroke and they don’t survive in the absence of proper medical care.” About 450 cows were brought to the cow shelter in Tappal on Wednesday after being rescued from the Gorai health centre, where farmers had locked them up. “When they reached here on Wednesday morning, 47 cows were dead,” said Gopal Singh, the pashu mitra deployed by the animal husbandry department at the Tappal cow shelter. “About 60 are currently extremely critical and may not survive.” Bhan visited the cow shelter on Thursday afternoon and treated some of the cows. “Three young calves have died today because of cold and two others will not survive the night,” he told ET. “About 1,000 cows are here in the open without any shade and cover. The extreme weather condition is making their survival tougher. More than medical, it is a management issue.” Doctors are administering analgesics, antibiotics and injections for strength building. “Every day we are receiving information about cow deaths from various cow shelters and villages,” said Bhan. 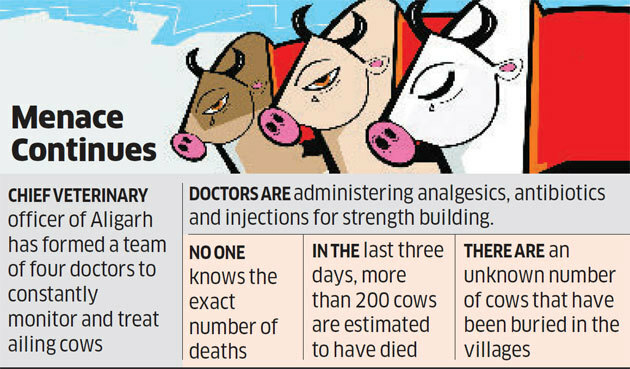 RK Saxena, chief veterinary officer of Aligarh, has formed a team of four doctors to constantly monitor and treat ailing cows. For the administration, too, the biggest difficulty is to get every cow checked and treated. “Those that are in the shelters are getting treatment. But those that are roaming outside are still suffering,” said an officer in the animal husbandry department. No one knows the exact number of deaths, but in the past three days, more than 200 cows are estimated to have died. Apart from these deaths, there are an unknown number of cows that have been buried in the villages.